Before the era of the witchcraft trials, there was a period of rumors. They started quietly, half-formulated whispers and slander, impossible to defend. The rumors continued until even the most respected High Stone was accused. An old woman in the village was clever, a little too clever. One day a young man tried to cheat her, but she outsmarted him. Embarrassed, he started the rumor that the old woman was a witch. The people of the town got together, carrying their torches, ready to burn the woman as soon as they found her. She tried to defend herself, but the other villagers remembered when the old woman had outfoxed them, as well. She could not outwit them again. As evening drew near, the villagers burned the woman from the highest rock. As the moon rose, they went home in triumph, leaving the pyre smoldering. The next morning, a black cat was found hanging from the highest rock. The rumors were confirmed. She was a witch! 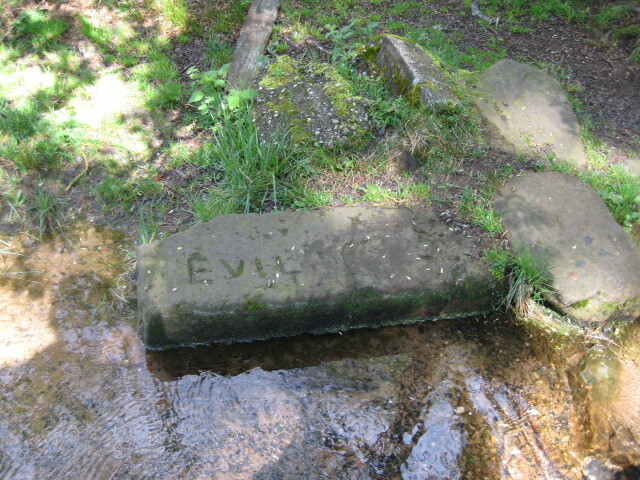 Next, the Stones near the Donon were accused of having received the mark of the Devil. The accusers pointed to indentations in the Stones vaguely resembling footprints. Things continuing spiraling downward until they reached the point where the Elder Stone decided to hold a meeting. Not that she really feared the Stones would be burned, how could they? But she was compassionate and open-minded. She saw beyond the Salm to the pyres that burned, one after another. Because the stones were slow to move, she was still considering her options when the Thirty Years War came along and soon there was no one left to burn. Before the land of Salm was called the Salm, there was a prince named Hellequin. From the time he learned to walk, he loved to chase. He chased his siblings, then his nurse, the footman, and the valet. At Mass, he chased the altar boys, and even other members of the congregation. The King never corrected the spoiled prince and no one dared to say anything. Soon the prince’s love of the chase became an obsession. The prince grew into a handsome young man with dark flowing hair and amber eyes that glinted with mischief. One day at Mass, a rabbit wandered onto the altar and Prince Hellequin could not contain himself. He jumped after the rabbit, chasing it all over the altar, knocking over the chalice and ciborium, and spilling their consecrated contents. The priest raised his eyes to heaven and asked God for help. God heard the priest. Suddenly the floor of the altar disappeared and Prince Hellequin fell into the pit. Frantically, he grabbed hold of the altar to keep from falling. Three hounds leaped from the pit, grabbed the prince, and ripped his body with ferocity. Blood spurted all over the horrified priest who backed into the corner of the altar. The hounds stepped back and the prince stood and smiled. Blood dripped from gaping holes in his body and his amber eyes glowed as fire. He pointed toward the congregation and immediately the dogs jumped toward the crowd. As quickly as victims fell, they rose and joined the pack of wild dogs, attacking other members of the household. The king finally came to his senses and shouted at his son to stop the carnage. Instead of minding his father, the prince attacked him. Soon the entire household of Hellequin had joined the hunt. They rushed toward the stable, mounted the royal horses, and charged into the countryside, so fast that the horses’ feet left the ground. The whirl of the hooves, blowing horns of doom, and screams of the damned, filled the air, accompanied by furious winds, lightning, and thunder, and with a terrifying whirl, and the specter disappeared into the clouds. Especially on Halloween or between Yule and Twelfth Night, whilst the dead still walk among the living, as they usually do during these thinly veiled times; beware the deep of the night. Be sure to leave the final sheaf of wheat in the field and do not remove the feast from the table to allow the ancestral spirits to come and collect their portion, else, the household of Hellequin will collect their share of souls. Pity the traveler who dares to wander by himself as he may hear the sound of whispering leaves. The whispering may be the wind, but assuredly, it maybe the Hellequin, roaming the skies, scanning the countryside with his band of demons. As fire flashes from the eyes of the prince, his black hellhounds and from the hooves of black horses, the wild souls of the damned sweep down and grab their prey that have no choice but join in the hunt. 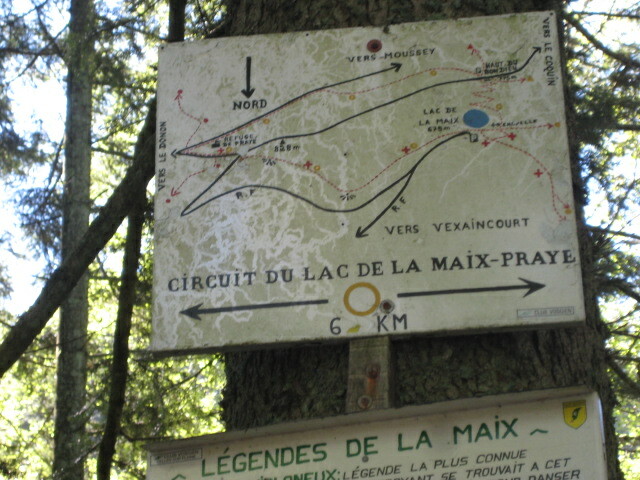 In the novel, THE DESTINY OF THE DROP OF HEAVEN, Martin played his violin in the shadow of the chapel at Lake de la Maix. Furious that a celebration commemorated the memory of a witch, Bishop Michel started a legend that it was, in fact, the devil playing the violin at the lake. 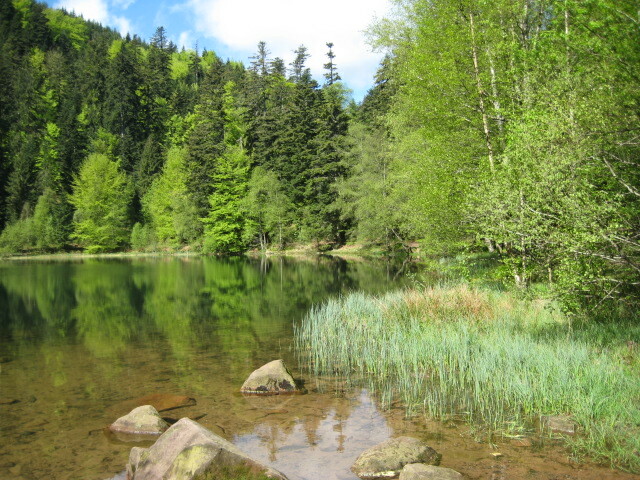 High up in the mountains and pine forests of the Vosges, there was a break in the trees where the sun shone brightly on a peaceful meadow. Tall grass and wildflowers covered the area. Soft breezes wafted their perfume in the air. A single oak tree towered above the meadow. Its sturdy boughs arched toward the heavens and spread a cover of dappled shade through its branches. Its age-old roots weaved as tentacles deep into the earth. At the edge of the meadow, a little chapel housed a beautiful statue of the Virgin where a hermit monk lived. Peasants brought bouquets of flowers in spring and asked the Virgin for the blessing of rain if the summer was too dry. Each year on Trinity Sunday, pilgrims from Salm and all the surrounding hamlets and villages of the Vosges, gathered before dawn to commemorate the chapel and give thanks for the abundant blessings the Virgin had bestowed upon them. They began by processing to the chapel where the monk celebrated Mass, after which the pilgrims held an all-day celebration in the shade of the oak tree. At Vespers, another ceremony ended the celebration and everyone returned home in the twilight. One year, the Mass seemed very long to the pilgrims, and it was midday before they were able to gather in the clearing for the festivities. After their meal, and maybe a little too much wine, the musicians pulled out their lutes and the young people began dancing. The monk, realizing his homily may have been a little too long, merely watched from his step. After a while, a new musician appeared. Dressed simply, he carried himself with an air of confidence. His smile glistened brightly and his eyes sparkled as if a fire burned within him. He played a melody that the simple folk of the Vosges had never heard. The sound came from a violin. Even the other musicians quieted their instruments to listen. Attentive to the captivated audience, the newcomer smiled charmingly and bowed. He brought the bow to the string, and began to play. As if mesmerized, young and old clapped with delight. The violinist’s eyes began to blaze as he played faster and faster. The peasants danced, whirling for hours without becoming fatigued. When the evening drew near, the monk rang the bells of the chapel for the concluding service at Vespers. The pilgrims hesitated, knowing it was time to end the celebration, but the violinist played an even more beautiful melody and the pilgrims could not pull away from the trance. Surprised that the peasants ignored their tolls, the monk rang the bells again, but the pilgrims were so intoxicated by the melody, they could not stop dancing. The sound of the tolling bells of the chapel, the swell of laughter and shouts of joy of the pilgrims, and the melody of the violin filled the air with a deafening roar, so loud that nobody noticed the black clouds gathering above them or the earth begin to quake. Suddenly the great oak split in two, as if struck by lightning. Water began to bubble up, and before they realized it, the earth began to sink. The joyous tumult became ear-shattering screaming and wailing as a pit opened. The beautiful meadow collapsed bringing the great oak with it. The monk watched in horror as the black void grew, completely swallowing the revelers. Waves burst forth from the chasm, and within minutes, the entire meadow was gone. The groans and wails of the pilgrims quieted. 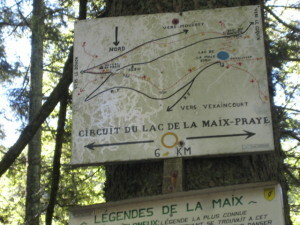 The sky cleared and the sun shone brightly on the newly formed Lake de la Maix. The monk fell to his knees, praying for the salvation of the lost souls, when he heard the sound. At first, he thought it was just the wind rustling through the pines surrounding the lake. Then the echo became louder and louder. The sunshine blazed off the water, boring into his eyes, into his brain. In the brilliance, he could see the blazing eyes of the stranger. From those eyes came the sound of the violin, and the cries of the pilgrims, now prisoners in the depths of the lake, damned to dance until the end of time. As the sound grew louder, the melody changed into the rising of laughter, mocking laughter. The laughter of the Devil. This story, as told by Monique Marie François, was relayed to me by my cousin, Françoise Cordier, and is woven into the backbone of the novel, FROM THE DROP OF HEAVEN. The Savage King of the county heard the news and feared this child of God wished to become king in his place. He called all his soldiers and ordered them to kill all the little boys in the country. Poor Mary thought only to save her baby. She was lost and came round Vipucelle, which was not yet called Vipucelle. 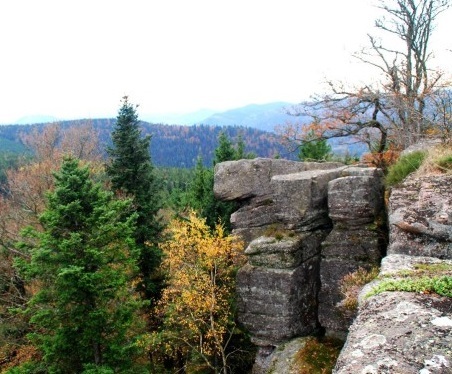 The beautiful forests of the Vosges frightened her and at the same time reassured her. What soldier would come looking for her here in the dense forest? During this period, the great empire did not even know this country existed. Thanking the Good Stones, she decided to live there. The poor woman ran as fast as she could, despite the hills and brush, but was not as fast as men on horses and dogs who constantly gained on her. The chase led her to the edge of Grandfontaine. 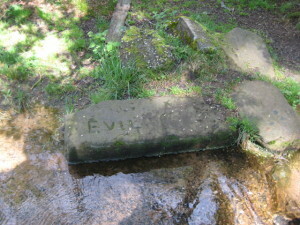 The Cornerstones still speak of it today, especially the one called Marie Roche Bois, or the Rock of Mary of the Woods. The abbot, meaner than the soldiers of the Wild King, decided these babies could not go to Heaven. No Baptism, No Salvation! He did not care that innocent children would be punished, never to be in the presence of God. No exception of the law was possible as only Baptized children could go to heaven.